I am usually a bumbling idiot when it comes to things. It's my go to look. It suits me, really. It can be annoying at times though so I completely apologize to the people I interact with. Rarely do I become speechless on things that surrounds me but on my recent travels I am left in awe and silence just to take in the vastness and beauty of the locations. Joshua Tree is one of them. This was a random excursion thought up days prior the actual trip. An unplanned adventure that was cooked up by a ghost of 8 years ago. Honestly it was actually a second choice of mine since I really wanted to take a day trip to Yosemite but given the weather that nature has thrown at me, it was a no brainer to take the drive. Nestled two hours or so outside of Los Angles and a mere three hours (seems like a lot I know but I don't mind the drive really) from where I live, I threw some clothes in a bag last minute, as usual, and hop on the car, swooped up Meg, and off we went. The drive was not bad at all and since we left early enough, we avoided traffic but was met up by the strangest weather I have seen. Rain and strong winds pummeled my little Mazda and it slowly clears up to a bright cloudless day and greeted by the most overly color saturated rainbow I have ever laid my eyes upon outside CGI and magazines. It was amazing. And it all happened because we got lost in Palm Springs because someone needed to purge their bladder, eat some lousy doughnuts, and look for seaweed. Yes seaweed. One of those was I but I'll let you guys decide which mission was mine. Where was I? ... Right ... Rainbows. Any ways, yada yada yada, colorful rainbow magic sprinkles, unicorns, and candy corns, it was amazing. End of story. Remember the whole bumbling idiot bit I said earlier? Yes. I think I made my point. Moving along. Joshua Tree is a magical place. I'm sure there are more deeper adjectives to describe the place but I will stick to the common, valley girl term of magical. It is a lot to see and a lot to take in. Especially if you like rocks. A bunch of rocks. Some glorious amazing rocks. It is a desert of rocks. Rock formations that you won't see anywhere else. At least in California. "We are still in California" will be a constant thought while staring at this vast alien landscape of dirt and rocks and of course these weird, Dr. Seuess looking trees called... drum roll please... Joshua Trees. Like rocks, they are everywhere. EVERYWHERE. They cover the landscape like the hair on my legs, I am sorry for the visual, but this is the reason why this place is called Joshua Tree. I guess it's more appealing that it being called Bunch o' Rocks Placeymagig. Obviously, I won't be taking the job of naming towns. I could have spent a few days in Joshua Tree National Park. It is a massive area. It takes more than 40 minutes to drive through it with decent speed. You'll never run out of things to do. It's a mecca for bouldering, great campgrounds that are well taken care of, and hiking trails aplenty. It is also a dangerous place for people has died while getting lost and wandered off of trails and taking their adventures way too far beyond their experience. As a note, please know your limits if you do decide to go. Carry water at all times and remember that this is raw nature. Respect it, appreciate it, and love it. With that being said, we spent a day in Joshua Tree NP. At least this trip. We really came here to just check out the location with no high expectations and ended up leaving humbled and in awe by the experience and beauty of nature. This was the day I fell in love with this place. I went back a few more times after this trip and there are more adventures planned in the near future. Night time in Joshua Tree is something to be seen, seriously, but that will come to a later post. 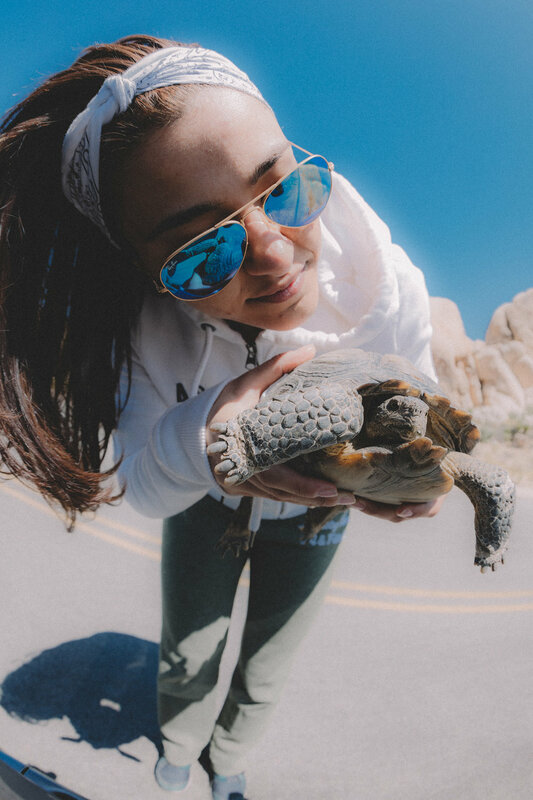 But for now, here's some random photos of the trip and of this desert turtle we rescued crossing the road almost getting ran over by a Cadillac. We named her Miss Shell Obama.